Klamath Falls, located in southern Oregon, was founded in 1867 and was originally called Linkville up until 1893. The city’s name was then changed to Klamath Falls. The population is currently at 21,524 as of 2016 and has been increasing since the start of Klamath Fall’s history. In 1890 the population was as low as 364 people notoriously known to be a small, rural Oregon town. Since the 1910s, the population has been on the rise and increased by the thousands rapidly reaching 18,901 by the 1930s. The first movie theater noted in Klamath Falls was the Houston Opera House in 1894. There has been evidence that Klamath Falls has had nearly 11 theaters since its inception. From 1905-1929 these include the Houston Opera House, Temple Theater, Star Theater, Orpheus Theater, Pelican Theater, Strand Theater, and more. In the late 1940s, as the population in Klamath Falls rose so did the rise in theaters. Today, only two theaters remain open: Pelican Cinemas and Ross Ragland Theatre. Well-known for it’s 300 days of sunshine, Klamath Falls is recognized as “Oregon’s City of Sunshine” with long hot summers and short snowy winters. Logging was it’s first major industry, as the first few decades timber harvesting was heavy. To much surprise, Klamath Falls has a sister-city all the way across the world in Rotorua, New Zealand. The idea of sister-cities or “Twin Towns” was developed after World War II to more-closely connect the world. It is a sign of peace and reconciliation no matter different cultures. Politically, Klamath Falls is known for being one of the more conservative cities in Oregon, having only voted for a Democratic president eight times (Leip). Klamath Falls is and has also been predominantly white. Despite this, much of Klamath Falls, seemed to despise the Ku Klux Klan. 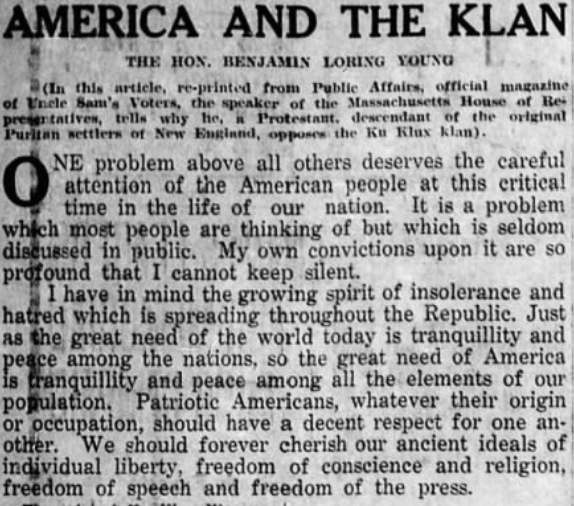 Going back to at least 1923, there were articles decrying the Klan, saying that the American people should “cherish our ancient ideals of individual liberty, freedom of conscience and religion, freedom of speech and freedom of press” (Evening Herald). Much of Klamath Falls also seemed to care a great deal about the going ons of the world outside the city. Looking through old issues of the Evening Herald, one finds not just news of Klamath Falls on the front page, but also of news from around the US and sometimes even overseas. 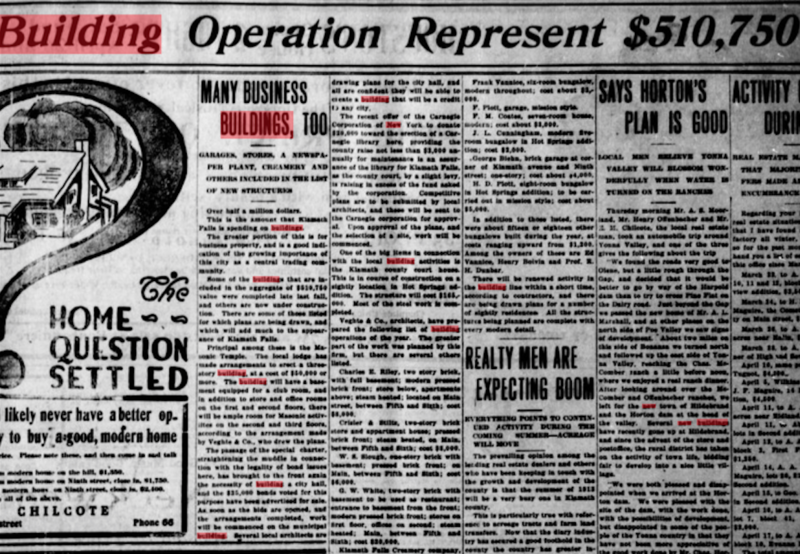 Talks of peace during war seemed to be a recurring front page story during early 1918. 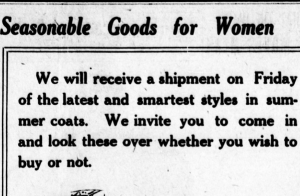 Another thing that one would notice looking at old Evening Herald issues, are the ads. Looking at the ads can give hints at the target demographics. The ads seemed to target the middle class. 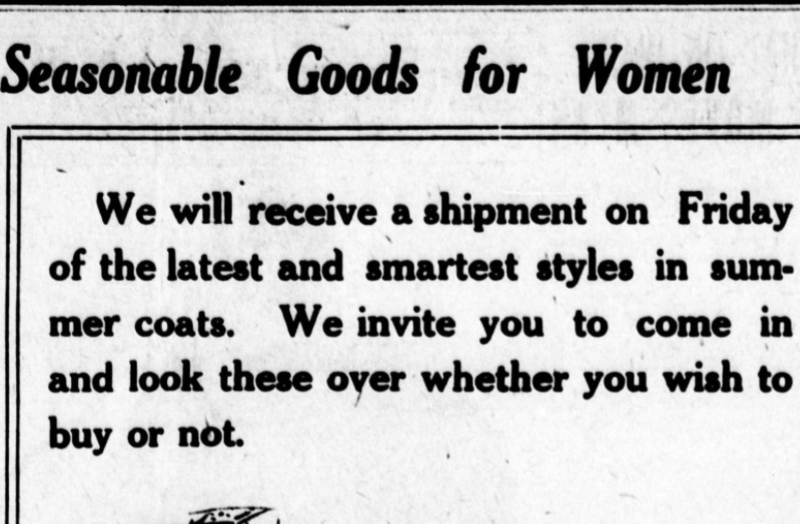 Ads for women’s clothing, tobacco, along with sales seem to make up a large part of advertising during this time period. Overall, Klamath Falls seems to have been your run of the mill small middle class town. A large portion appears to have been conservative, but also fought for the individual freedoms of all people. Very little indicates that it had a very affluent community; based on the papers, it seems like it was largely lower to middle class. And it appears as if not much of that has changed today. The median income is quite less than the rest of the United States and is over 70% white (Data USA). 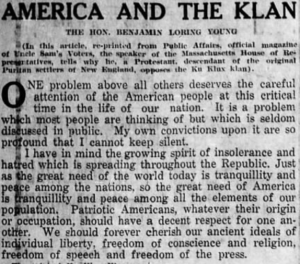 “America and the Klan.” The Evening Herald, 20 Dec. 1923. “Klamath Falls, OR.” Data USA, datausa.io/profile/geo/klamath-falls-or/. Leip, David. “Dave Leip’s Atlas of U.S. Presidential Elections.” Atlas of U.S. Presidential Elections, uselectionatlas.org/. 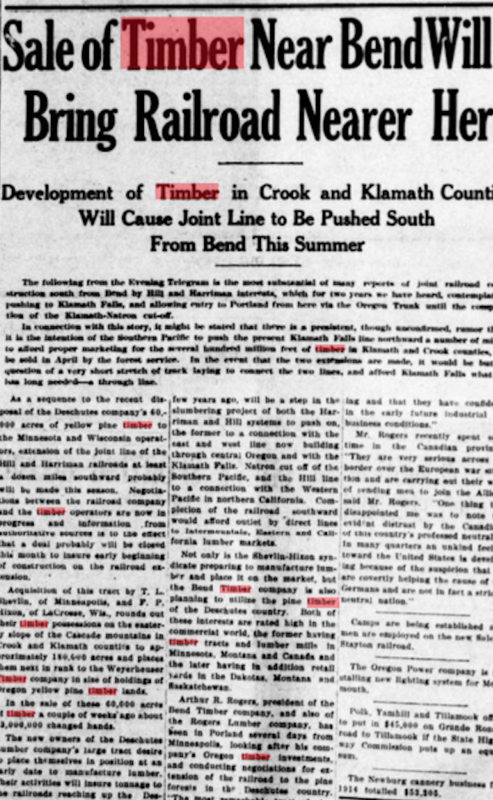 At the beginning of the 19th century, Klamath Falls relied heavily on the production and sale of Timber. 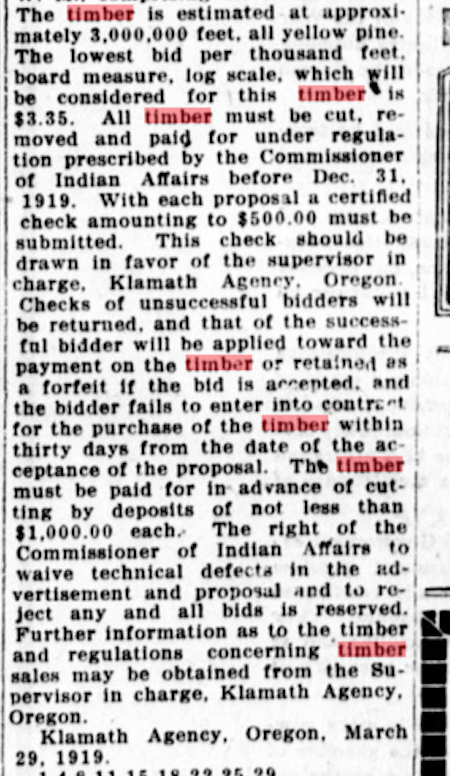 Advertisements for the sale of Timber, like the one shown, were common in every daily newspaper in Klamath Falls, Oregon. The specific rules for the selling of timber are featured in the advertisements as well as the specific prices for the timber. The timber is advertised in a very professional and mandated way inferring that the timber business in Klamath Falls is significant and requires strict regulation and pricing. 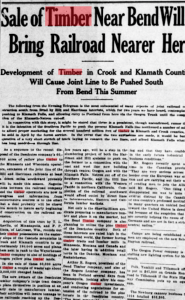 The sale of timber also greatly influenced infrastructure through Klamath Falls. The advertisement below explains the rise of railroads as a direct result of timber. Along with railroads, the advertisement talks about the development of a new and modern sawmill and a planing mill. Electric power will be filtered through due to power plants from the Deschutes River. In the newspaper, the city of Klamath Falls welcomes this type of infrastructure saying that it is “adapted for easy and economical ligging operations”. 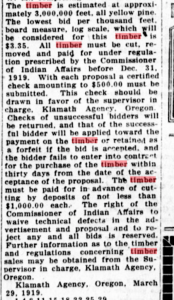 The newspaper article also mentions the failing condition of the lumber industry and as a result, the desire and need for the continued sale of timber. Along with the growing rise of railroads, Klamath Falls in the early 1900s had an increasing interest in realty. There was an immense growth increase in businesses and offices. This corresponds greatly to the increase in population in Klamath Falls. The population in Klamath Falls increased significantly from the beginning for the 1900s to the 1930s creating a demand for more buildings and convenient infrastructure making it easier for people to get to work. 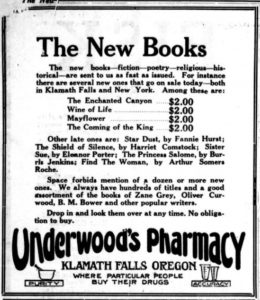 The arts & culture scene in Klamath Falls prior to 1930 is notable for its emphasis on music, dance, literature and of course film. Upon research in The Evening Herald, their most popular newspaper at the time, many advertisements widely reference these three aspects of Klamath Falls cultural history. There are various ads reaching out to citizens to come into the Klamath Falls Music House. I assume that this is the biggest music store that Klamath Falls has at the time, considering the small population of the town. Often time these ads references “The New Edison” discs and focuses on the wide technological innovation. But, each advertising focuses on a different marketing strategy to drag customers in. 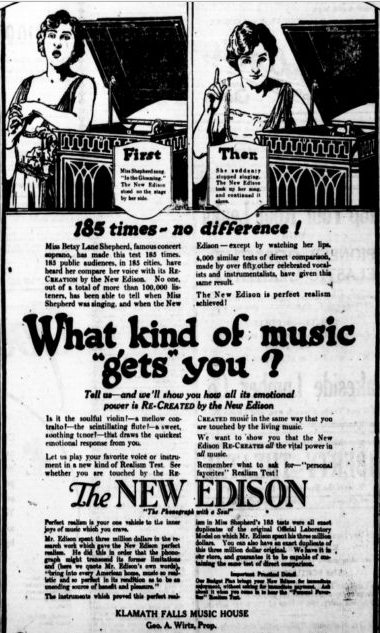 For example, “What kind of music ‘gets’ you?” is the headline for an ad from October 13, 1920 and features a drawing of a woman showing you the steps to working this “phonograph with a soul”. Looking through The Evening Herald there are also many advertisements mentioning dance events around the town. 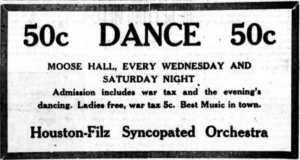 It seems that the dance culture was extremely popular prior to the 1930s. 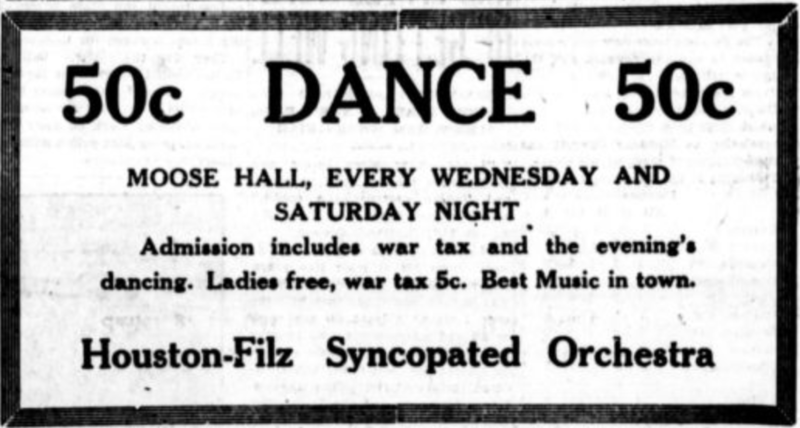 One ad shouts the words “50c Dance 50c” at the readers, giving them information of a weekly event at Moose Hall. 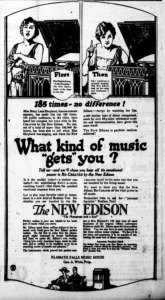 This advertisement features “The best music in town” from the Houston-Filz Syncopated Orchestra. 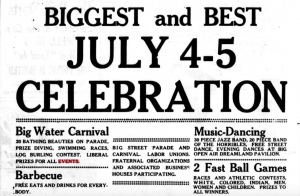 There are other various ads mentioning dance events and carnivals around the town referring to how much people enjoyed it and what occurred there. Finally, the literature community is huge in this town. 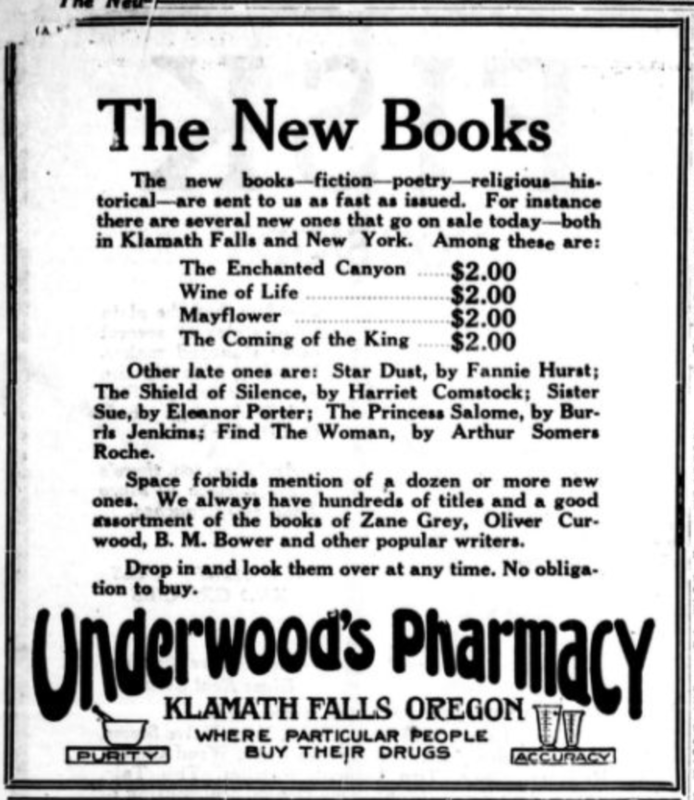 There were many ads alerting the citizens of sales at bookstores for as low as $2.00 and genres (fiction, poetry, etc) that satisfy any customer. 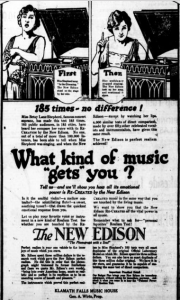 Additionally, there were a lot of ads mentioning events that were full of “music and poetry” and giving information to places where people could find stuff like this. The most interesting thing I found was various poems in the newspaper, that I assumed was published from either the authors/editors or the papers readers. H.W.P. 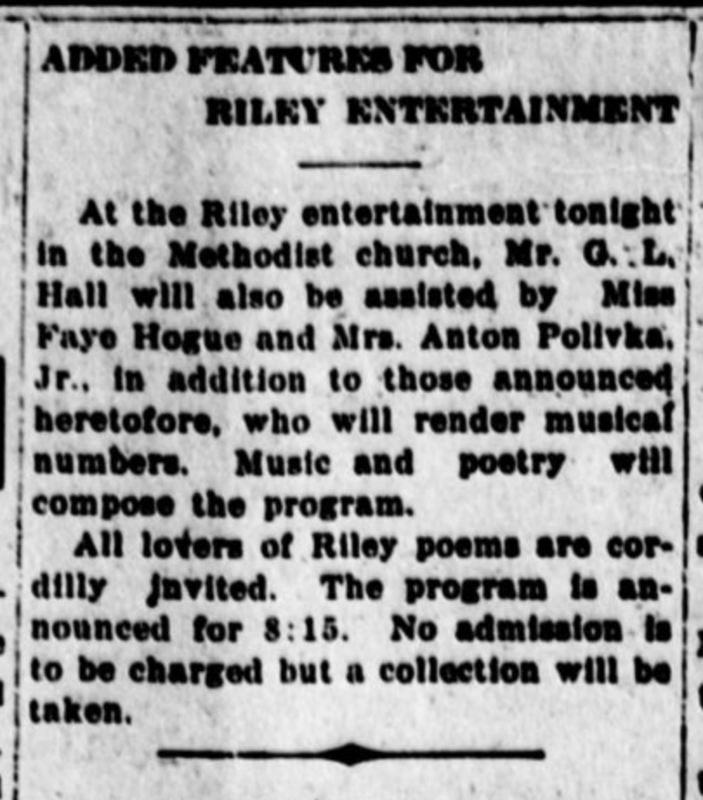 had a poem published in an August 1919 edition of The Emerald Herald talking about film culture as he mentions “Two Wonderful Pictures” and one of the theaters in the town – Liberty. This piece was titled “More Truth Than Poetry” and is an interesting read! “What Kind of Music Gets You?” The Evening Herald. 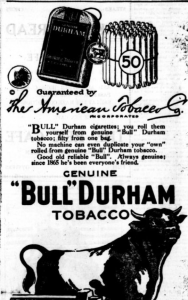 October 13, 1920. 7. “50c DANCE 50c.” The Evening Herald. September 26, 1921. 6. “Dance at Bly is Enjoyed by Many.” The Evening Herald. October 24, 1916. 4. “Indians Dance in Costume; Carnival Crowd is Pleased.” The Evening Herald. July, 6, 1921. 1. “More Truth Than Poetry.” The Evening Herald. August 9 1919. 8. “The New Books.” The Evening Herald. April 6, 1921. 6. 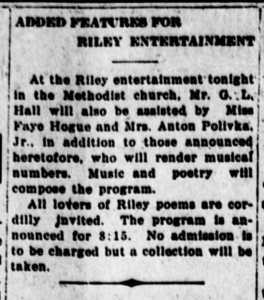 “Added Features for Riley Entertainment.” The Evening Herald. August 16, 1918. 4. 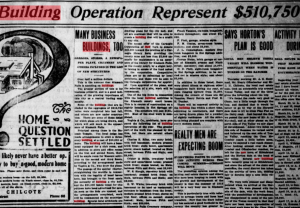 While digging in to The Evening Herald, I read up on a lot of fascinating stories that were happening in Klamath Falls, Oregon between the dates of 1905 and 1929. To begin, according to the Bureau of Municipal Research and Service, Klamath Falls contained less than 1,000 residents in the early 1900s. Over twenty years, Klamath Falls went from having about 500 residents to having about 16,000 by 1930. Through my research, I was hoping to dig and find out interesting information regarding the town itself and less on the cause behind people migrating to Klamath Falls, Oregon over that twenty year time period. However, through my research I found a correlation between key events that took place in Klamath Falls and the reasoning behind why people would want to move to Klamath Falls. From the information I explored, I found Klamath Falls to become very family orientated throughout this time period. For example, Klamath Falls had an enormous celebration every Fourth of July which included a water carnival, music and dancing, barbecues, and games to play. 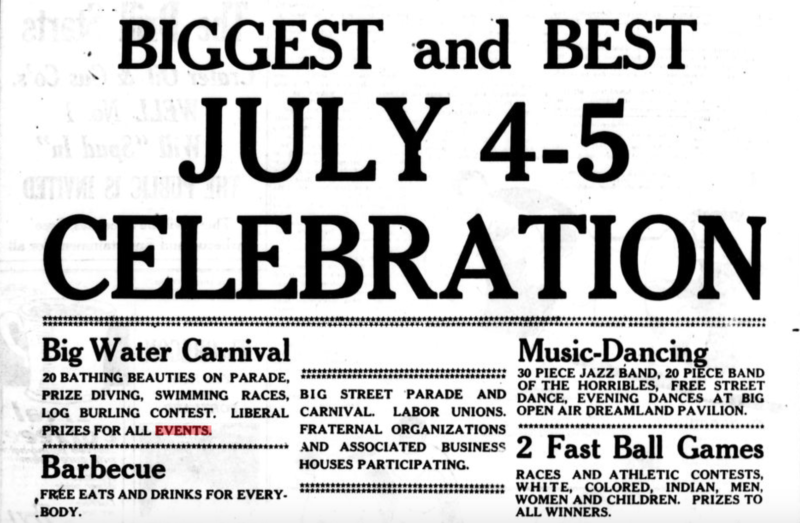 In addition to the Independence Day celebration, Klamath Falls was known to hold wrestling events in an open-air pavilion that could hold up to 2,500 residents. 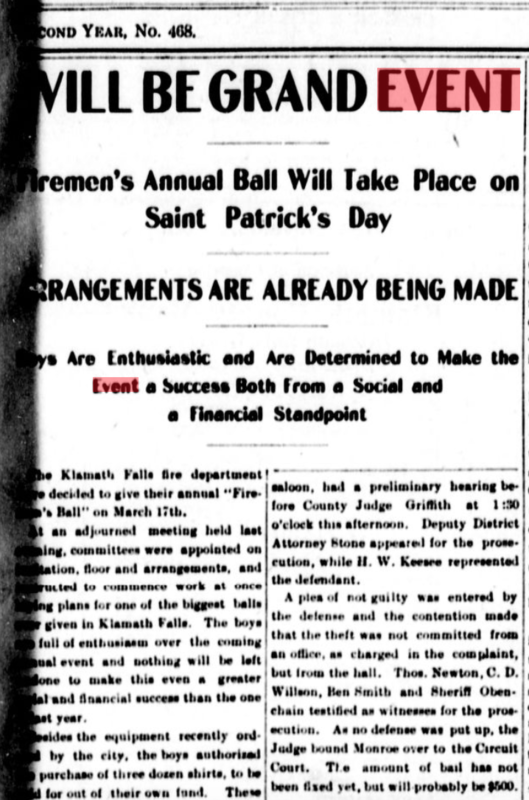 In addition to these celebrations, Klamath Falls also hosted a firemen’s ball once a year usually around Saint Patrick’s Day. These types of celebration help to attract people to Klamath Falls as the environment at these events are special, exciting, and fun. 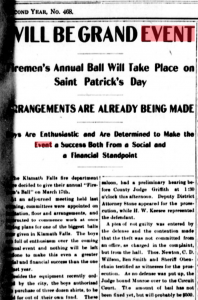 Aside from celebrations such as these, The Evening Herald did an excellent job at informing Klamath Fall locals on current events such as current trials taking place at the local courthouse. All in all, Klamath Falls was very family orientated, engaging, and informing during this time period!